In the second installment in the “Full Cast(le) Recording” series, the Vassals of Kingsgrave ascend the auditory stage to perform a dramatic reading of Jaime VI from A Feast for Crows. 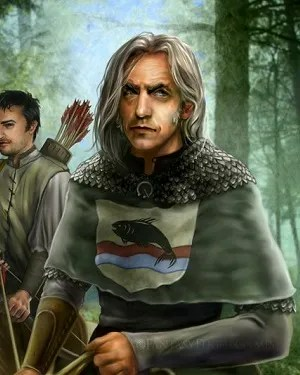 Stick around after the curtain falls to hear the vassals discuss the chapter, debate the sanity and circumstance of Brynden Tully, and inevitably wind up debating the various deviations of HBO’s Game of Thrones. This entry was posted in A Song of Ice and Fire, Books & Novellas, Full Cast(le) Recording, Podcast and tagged Alias, Asha Greatjoy, FTWard, inkasrain, Lady Griffin, LordManderBlee, middlecyclone, Pod's Plight, Shellfish, witless chum. Bookmark the permalink. I love these. You guys do such a great job with the readings and sound effects! Please do more!